Obama: We all remember moment "mankind finally was untethered from this planet"
WASHINGTON (CNN) -- President Obama on Monday hailed the Apollo 11 astronauts who made it to the moon 40 years ago as "genuine American heroes" and "the touchstone for excellence in exploration and discovery." 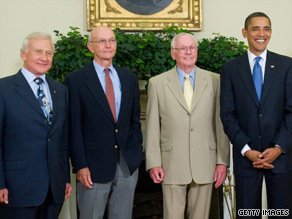 President Obama welcomed Neil Armstrong, Michael Collins and Buzz Aldrin to the White House. Welcoming Neil Armstrong, Michael Collins and Buzz Aldrin to the White House, Obama said the lunar landing and subsequent walk on the moon by Armstrong and Aldrin continued to inspire young people to study math and science in hopes of becoming astronauts. "On this 40th anniversary, we are, all of us, thankful and grateful to all of you for what you've done," Obama said, standing beside the three former astronauts. "I think that all of us recall the moment in which mankind finally was untethered from this planet and was able to explore the stars," Obama said, praising the "heroism, the calm under pressure, the grace" of the three men and the entire NASA team in carrying out the 1969 moon mission. As a boy in Hawaii, Obama recalled, he would go out with his grandfather to welcome back astronauts from missions that concluded with Pacific Ocean landings. "I remember waving American flags and my grandfather telling me that the Apollo mission was an example of how Americans can do anything they put their minds to," he said. The Apollo 11 anniversary has raised questions about whether the United States should resume moon missions. Obama's comments made no mention of specific missions, but he noted the presence of NASA Administrator Charles Bolden and his deputy, Lori Garver, and said the space agency would continue to fulfill its role as a source of inspiration. NASA is working to return astronauts to the moon by 2020 and establish a lunar base that would allow them to stay on the desolate surface for up to six months by 2025. The goal this time is for the explorers to make themselves at home, study the terrain and learn how to work in a harsh environment to prepare for trips beyond the moon. "The next giant leap has begun," NASA promises on the logo of its Constellation Program, the new fleet of space exploration vehicles that the agency's former administrator, Michael Griffin, once famously called "Apollo on steroids." Set to replace the space shuttles, Constellation builds on the legacy of Apollo -- the program that landed humans on the moon six times in the late 1960s and early '70s -- but incorporates modern technologies and influences. Aldrin, looking forward to the next 40 years, told CNN the most important thing is the leadership within the space program. "Going back to the moon and getting there 50 years after we were there before is not real leadership," Aldrin said. "We can then take our resources and establish a pathway of progressive achievement that will be very exciting, much more exciting than just going back to the moon, and that pathway is the permanence at Mars," he said.